Why Assume Jesus Wasn’t Married? This embarrassing aspect of human nature has been on full display once again on television screens and news headlines. A scholar from Harvard University has presented a fragment of papyrus, allegedly copied about three centuries after the days when Jesus walked on the earth, that includes this clause: “Jesus said to them, ‘My wife.’” The news media reacted as if the five Coptic words underlying this clause had suddenly reset the entire field of biblical studies. Other scholars have already raised valid questions about the fragment’s authenticity as well as pointing out the irregularities in how the research was publicized. All of this kerfuffle will soon die down, quite possibly with the revelation that the fragment was a forgery in the first place. Looking at the second- and third-century sources, I’m not so sure. 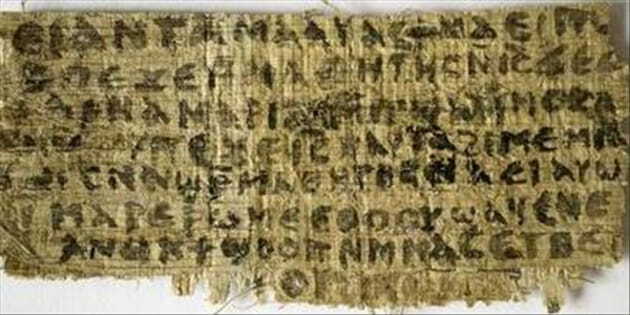 In the first place, while certainly possible, it’s far from certain whether the fourth-century fragment known as The Gospel of Jesus’s Wife was translated from any second-century text. Furthermore, Coptic texts of this sort did not emerge in the context of “intra-Christian controversies” but from breakaway Gnostic sects, groups that had rejected the witness of the apostolic eyewitnesses. The primary concern of the Gnostics would not have been whether Jesus was actually married but how they might portray Jesus in a way that would illustrate their own myths and rituals. About the time that Clement was writing against false teachers who regarded marriage as immoral, a lawyer named Tertullian became a Christian and quickly turned his rhetorical skills toward defending the Christian faith. In a treatise urging monogamy, Tertullian of Carthage mentioned that Jesus, a lifelong celibate, had made God’s kingdom accessible to those who—like Jesus—never engaged in sexual relations (“… ipso domino spadonibus aperiente regna caelorum ut, et ipso spadone, quem spectans et apostolus…,” De Monogamia 3). Later in the same treatise, Tertullian termed Jesus “entirely unmarried” and “voluntarily celibate in flesh” (“innuptus in totum…spado occurrit in carne,” 5). The only potential evidences of alternative perspectives on Jesus’ marital status turn out to provide little, if any, real evidence at all. The Gospel of Mary—a text that probably originated in a Gnostic context around the time of Tertullian, long after every eyewitness of Jesus had passed away—merely mentions that Jesus “loved [Mary] more” than he loved other women (10). Most important of all, texts such as The Gospel of Mary and The Gospel of Philip—and most likely The Gospel of Jesus’s Wife, if the fragment happens not to be a forgery—originated among Gnostic sects that were far more concerned with describing arcane myths and rituals than with preserving any historical information about Jesus. Despite multiple media melees over the past few years that have implied otherwise, there is simply no reliable historical evidence to support the supposition that Jesus was married. The earliest references to Jesus’s marital status assume his singleness, and the writers seem unaware that anyone might think otherwise. Implications that Jesus was married originate in historically-suspect sources, written more than a century after Jesus walked the earth. I suggest that, if Jesus had been married, these references to the church as his bride would have—at the very least—required some further explanation. Perhaps a reference to his “spiritual bride” and his “earthly bride,” or some other shade of distinction offered to distinguish the church’s relationship to Jesus. Yet these statements, some of which can be traced back to eyewitnesses of the life of Jesus, seem to be made with the assumption that the church is Christ’s bride and he has no other, whether spiritual or terrestrial. This is admittedly a suggestion from silence, but—given the consistent metaphorical references to the bride of Christ—the silence regarding any earthly marriage seems significant. The idea of a married Messiah wasn’t rejected among the earliest Christians because such a revelation would cause the Christian faith to fall apart—it might cause theologians to rethink the way they frame some doctrines, but no essential belief in the Christian faith is dependent on the singleness of Jesus. A married Jesus wasn’t rejected because early Christians wanted to downgrade human sexuality—with few exceptions, they didn’t. The marriage of Jesus didn’t become part of the church’s story of Jesus for a single reason: In all the eyewitness testimonies to the life of Jesus and later reflections on his life, no reliable proof exists for such a marriage. The announcement of a so-called “Gospel of Jesus’s Wife” has done nothing to change that fact. Timothy Paul Jones serves as professor of leadership and associate vice president for online learning at The Southern Baptist Theological Seminary. Dr. Jones has been widely recognized as a leading writer and researcher in the fields of apologetics, Christian education, and family ministry. He has authored or contributed to more than a dozen books, including Misquoting Truth, Trained in the Fear of God, and the CBA bestseller The Da Vinci Codebreaker. Dr. Jones blogs at http://www.timothypauljones.com. Follow him on Twitter @timothywashere.